Your address in the USA! Making online shopping easy and affordable! Do you live outside of the continental USA, shop online, order from catalogs, subscribe to publications or magazines, and make purchases from USA or European based companies? ZipX makes receiving your packages easy by providing you with a USA or European address. 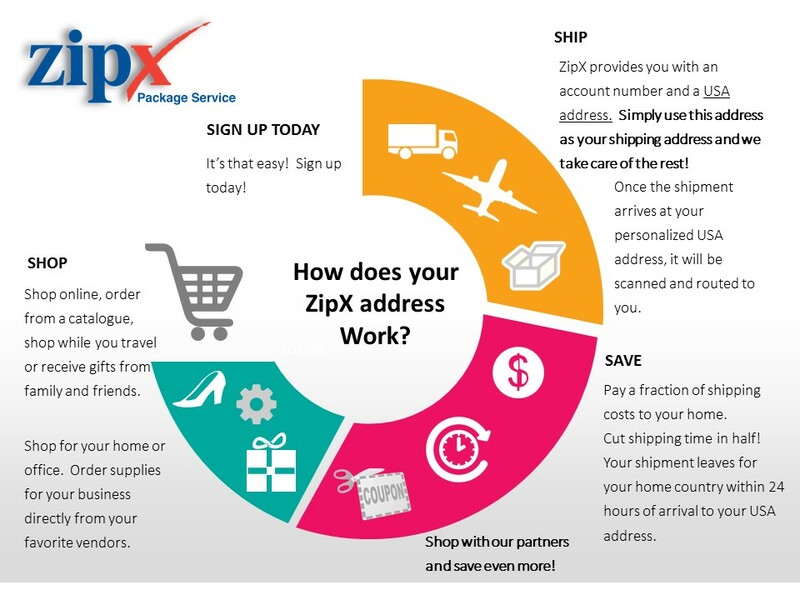 How it works: ZipX provides an official mailing and physical street addresses in the USA or Europe for those customers that purchase goods in the USA or Europe for ultimate transport to a foreign destination. The customers benefiting from this service would be those that shop on the Internet, order from catalogs, subscribe to publications, and make purchases from overseas vendors and prefer to use a U.S. or European address to receive their purchases. Once the shipment is received, ZipX's staff applies a bar code to the package and enters the necessary information into the ZipX database. After the record has been created customers can trace their shipment from point-of-origin to final destination. ZipX then arranges for transport for the package via the most expedient method(s), getting your shipment there in a fast, secure, and economical manner.